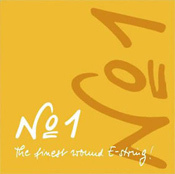 This is the special wound E string that has a diameter similar to a plain steel E. This means the tone is warmer than plain steel, but the response is quicker than a wound E string. 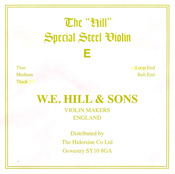 Suitable for use with any choice of A, D and G.
Hill is a popular plain steel E for use with any choice of A, D and G. 25 gauge is thin. 26 gauge is medium. 27 gauge is thick. This is another plain steel E. This is one of our top choices for our own shop instrument setups. 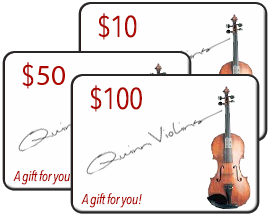 The 27.5 gauge E is a popular choice, because it is slightly thicker than other thick gauge E strings. The added mass takes a bit more edge off the tone shape. 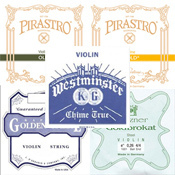 We assemble these bundles of 5 of the most popular E strings, to make it easy for you to try them. Also known as Kaplan Solutions. 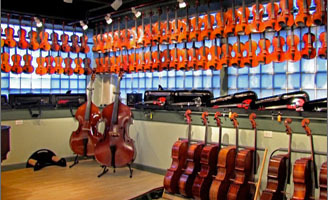 This is the E string recommended for those with a "whistling" issue on the E string of their instrument. It has a removable ball, to use as a loop end string if needed. 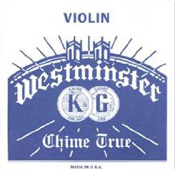 For decades, this was the top choice for use with Dominant A, D and G, or any other bottom strings. 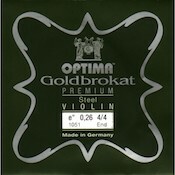 It remains a recommended choice for any mix of strings. 25 gauge is thin. 26 gauge is medium. 27 gauge is thick. 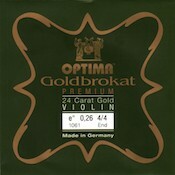 The Goldbrokat Premium Brassed Violin E String offers a soft, clear and warm sound. Brass coating provides protection from the elements. 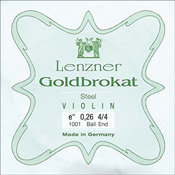 Goldbrokat Premium 24 Carat Gold E string is based on Goldbrokat’s special new steel alloy that offers a smooth surface and greater durability. Then, it is plated with 24 carat gold. 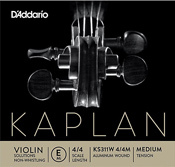 The result is a brilliant and powerful tone, like the original, but with a warmer and mellower tone balance. Goldbrokat Premium Steel is made from a new steel alloy that offers an extremely uniform and smooth surface and greater durability. 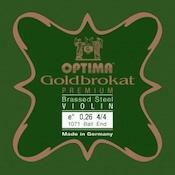 Brilliant and powerful, like the original Goldbrokat E, but with a slightly warmer, rounder tone.